The Good Trade's Week of Outfits Series highlights women that have personally inspired us to shop and live with intention. Each woman takes her own unique approach slow fashion and demonstrates how beautifully sustainable fashion can come to life. Today we're excited to share a week of outfits from Kat Vargas, the slow fashion blogger behind Finding Katnis! 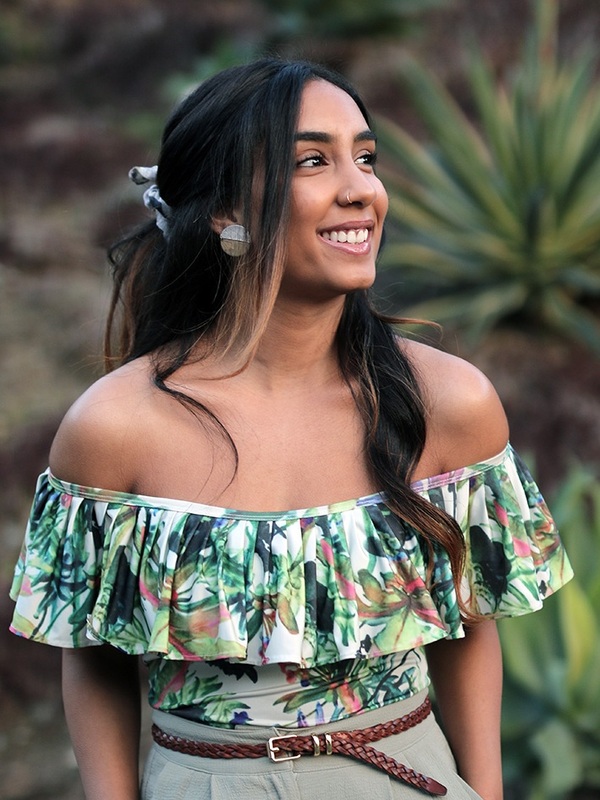 Favorite Brands | VETTA Capsule for chic versatile pieces, ABLE for fashion forward streetwear, Everlane for everyday basics and Mara Hoffman for colorful resort wear. My journey into the world of sustainable fashion started a few years ago out of necessity, but it was inspired by an old coworker’s commitment to her personal style. I admired her knowledge on the brands, designers, and fabrics she wore and how easily she could start a passionate conversation about her outfit following a compliment. This brought to my attention my disconnect with the clothing I was buying (and many times leaving with tags on, unworn in my closet) and I began doing some research uncovering the not-so-pretty truth about the fashion industry. My blog Finding Katnis soon followed. It started as a collection of travel photos, and soon shifted to focus on a personal account of my exploration of slow fashion. Since making my transition into an ethical consumer, I’ve built myself a guideline for shopping. Instead of shopping for things that appeal to me during a fleeting moment, I always buy to fill a necessity in my wardrobe. I choose natural fabrics over synthetics (organic is always a plus), and versatility over trends. After studying trends and taking too many quizzes claiming to help in identifying your personal style, I still can’t say I follow styling guidelines—I think style should come organically depending on your mood, and that’s usually what drives me while putting outfits together day to day. Mondays are usually my casual days in the week—I like to ease into the week, especially since Mondays are generally my busiest day at work so I want to make sure I’m comfortable. Comfort to me is found in a chunky knit sweater like this one from Vetta which has a removable turtleneck for that inconsistent office temperature. This sweater has been paired with anything from midis to mini skirts, but for my casual Monday suit, I’m pairing it with my super comfy Genie Slouch Jeans from ABLE. I love a good ripped pair of jeans, but up until owning the Genie I never thought I could really pull them off. Now I practically live in these. I absolutely adore midi and maxi skirts, but it’s hard for me to find a silhouette that feels just right and doesn’t look too costume-y or vintage. That’s probably why I’ve held on to this one from American Apparel for so long. I’ve owned it for about 8 years now, which is surprisingly the longest I’ve held onto anything since my fast fashion days. It is made from a printed washed silk and pleats in all the right places. I love this skirt so much; I’m hoping to make a similar pattern using its dimensions and get some practice sewing using similar fabrics. 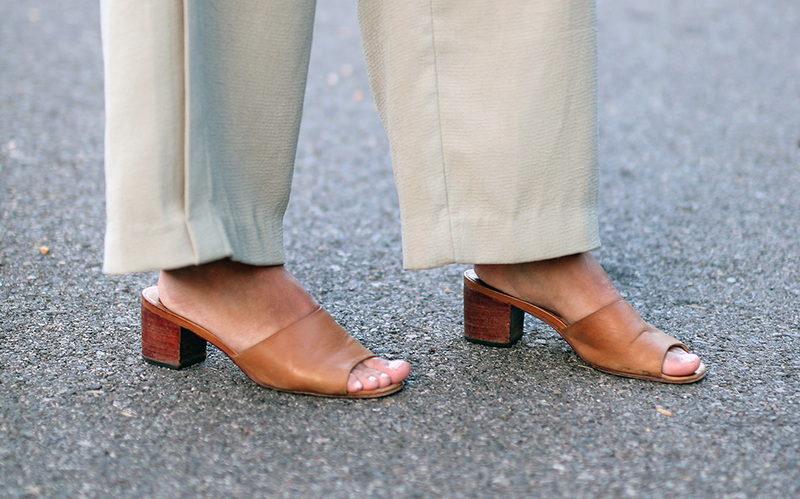 I’ve paired it here with my pima cotton turtleneck from Everlane, and my pre-loved mules from LOQ. Despite the heel, these shoes are super easy and comfortable to wear. My leopard hair-on clutch is by LA brand Clare V.
I moved to LA approximately 2 years ago, and if there is one thing I appreciate nearly as much as the idyllic climate, proximity to the beach, and plethora of vegetarian options at every restaurant is the acceptance of an all-white or mostly-white outfit year round. If you’re on the hunt for curve enhancing denim, you need to check out DL1961. They’ve truly mastered mixing sustainability with impeccable fit, using innovative fabrics to reduce their production carbon footprint. 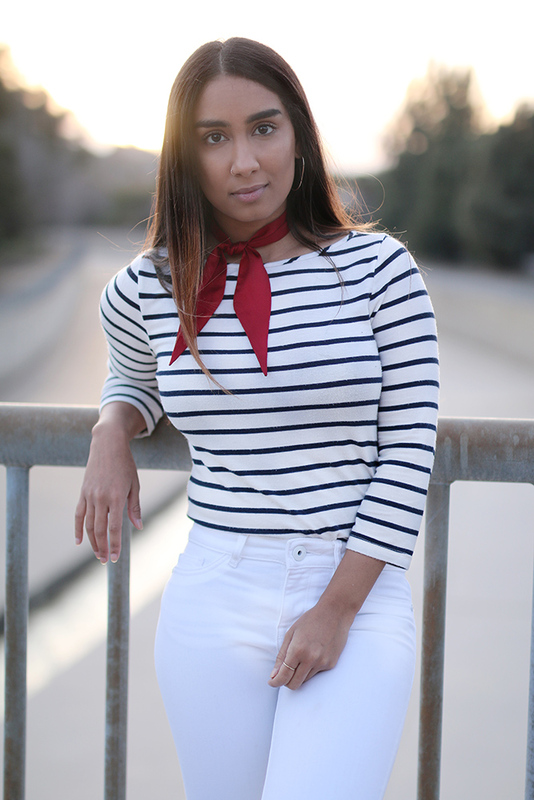 My long sleeve mariner striped tee is by the French-inspired brand Amour Vert, and it is made from the softest organic cotton on the planet! Lastly, my tres chic silk scarf is from SiiZU. This is a fun outfit that can take me from office to happy hour with my girls. I’ve blended different shades of green to get a colorful, yet cohesive outfit together. My bell-sleeved alpaca sweater is by Peruvian brand Ankura—they customized this sweater to my preference. Underneath, I’m wearing one of my favorite summer staples: the Zenia one-piece swimsuit by sustainable loungewear and lingerie brand Underprotection, made from recycled polyester. Finally, I’ve paired the outfit with my Elizabeth slides by Nisolo, and braided belt from Brave Leather. Is it obvious that I love color blocking? 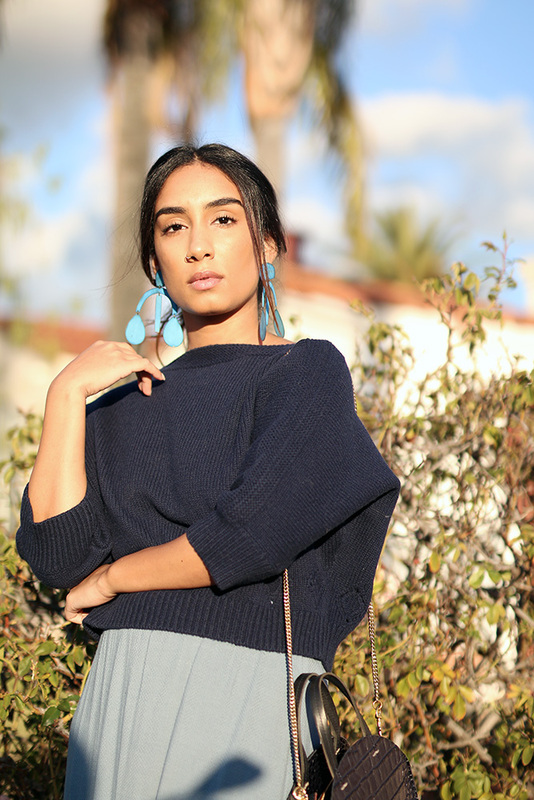 My navy cashmere sweater is by New York designer Demylee in collaboration with Clare V. My statement earrings are made from blue patina brass by Annie Costello Brown. I chose to wear this with this my light blue two-piece from the LA brand YSTR, which has unfortunately stopped production. Unfortunately, I’ve had to say goodbye to quite a few small scale sustainable businesses that were unable to compete against fast fashion, which is another reason why I am such a huge advocate for shopping local. Here is a simple yet fun outfit you’d probably catch me sporting to brunch. If you’re going to live in LA a jean jacket is a must, and this one by ABLE is super easy to wear. Under it, I’m wearing my cotton mock neck top by Everlane, and Leaf Tencel Paperbag pants by Back Beat Rags purchased from one of my favorite shops—Galerie LA. If you’re ever in downtown Los Angeles near The Row, Galerie LA is your one-stop shop for ethical shopping. Accessories are by Nisolo, and shoes purchased secondhand. You can catch me at the farmer’s market in this outfit, followed by a garden party to mingle with friends. Christy Dawn is known for their flowy and dreamy dresses, but who knew they could make jumpsuits that look this good? The seamstress that made this garment has incredible talent—you can definitely see and feel the craftsmanship. I accessorized this jumpsuit with my Sunnydip Fray hat by Australian brand Lack of Color, and shoes by the ever-so-in-demand Maryam Nassir Zadeh.